Dolby Atmos surround sound technology is taking the cinema audio experience to a new level, making current 5.1 and 7.1 systems seem simplistic in comparison. One of the first European installations of an Atmos system is at Kristiansand in Norway, where 54 Yamaha loudspeakers and 33 power amplifiers have been specified to deliver its exacting audio requirements. Atmos supports up to 128 simultaneous, lossless audio elements in a mix. Using up to 64 loudspeakers, it heightens the realism and impact of cinema by making the soundtrack fully immersive. An array of overhead speakers complements screen and wall-mounted units to allow sound to be precisely positioned anywhere in the auditorium, producing a natural, lifelike audio experience that perfectly matches the storyline. Owned by the Municipality of Kristiansand, the Kino has the highest footfall of any Norwegian cinema, with 370,000 filmgoers visiting each year. 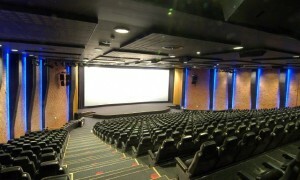 The Atmos system was installed in its 655-seat Screen 1 by Unique Cinema System (UCS), who specified the exclusively Yamaha speaker and amplifiers package. The surround system features 24 Yamaha Installation Series IF2112/64 and 14 IF2112/AS full-range speakers, plus two IS1218 subs, powered by 13 XP5000, six XP7000 and one TX4n amplifiers. The screen system comprises five IF3115/64 full range units, six IS1218 and five IS1215 subs, powered by ten TX4n and three TX6n amplifiers. Three ACD1 Amplifier Control Device interfaces are installed to monitor the XP series amplifiers. “The most important thing with an Atmos installation is that the loudspeakers need to deliver very high quality sound. This ensures that the spatial soundscape is very accurate, that the cinema audience hears sounds coming from precisely where they are supposed to be coming from. Any loss of audio quality will compromise that and make the system less effective,” says Dan Fulhendorf of UCS. “There are currently a limited number of films being delivered with the Atmos format, but the Yamaha system has radically improved the sound quality of every film shown in Screen 1. The best sound engineers in Norway gathered for a private screening of the James Bond film Skyfall in 5.1 and stated that they had never before heard surround sound with that much dynamic bandwidth,” adds UCS’s Tor Brede Michelsen. “By investing in something that is more than twice the size of a traditional surround system, the cinema management had to be sure that it would be a success. They are very pleased that audiences absolutely love it,” Dan concludes.